Alan Holmes broke the national record in squat with a 645 pound lift at the State High School Powerlifting Championship meet held at the Sheridan Gym April 30. Alan Holmes placed first in the 275 pound class. Holmes broke the state and teenage records in bench press with a 350 pound performance, deadlift with a 605 pound lift, and total lifts with 1600 pounds. Holmes also won outstanding lifter in the upper division. Mike Crain placed first in the 132 pound class. He broke state records in squat with a 385 pound lift, deadlift with a 435 pound performance, and the state record for total lifts with 1035 pounds. He also broke the teenage record in deadlift and total lift. Crain won outstanding lifter in the lower division. Phillip Clifford placed first in the 181 pound class and broke the state record and teenage record in squat with a 525 pound lift. He also broke the teenage record in deadlift with a 505 pound performance and broke the teenage record for total lift with 1305 pounds. 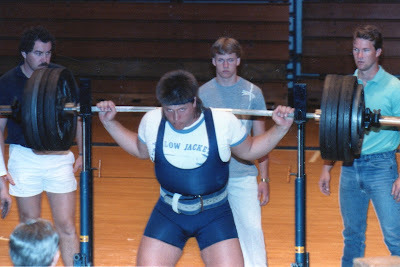 Gary Brown placed first in the 198 pound class and broke three teenage records. They were in squat with a 495 pound lift, deadlift with a 540 pound lift, and total lift with 1255 pounds. Tim Staley placed first in the 242 pound class by breaking the teenage record in squat with a 465 pound performance. Steve Polk placed second in the 220 pound class. He broke the teenage record in deadlift with a 495 pound lift. Placing second were Sean Woodward in the 123 pound class, Brett Epperson in the 198 pound class and Dale Hatley in the 275 pound class. Shawn Plouch placed third in the 165 pound class while Jamey Black placed fourth in the 220 pound class and Wayne Hitt placed fourth in the 148 pound class. Other Sheridan lifters competing in the meet were Michael Harris, Clarence Howard, Jonathan Bibb, Roy Clark, Jonathan Jennings and Justin Gaddis. Picture here are (front) Jamey Black, Phillip Clifford and Gary Brown ('89) and Alan Holmes. In the back on the bleachers are Brett Epperson and Tim Staley ('89). These two pictures you see here are just a few of many provided by Jamey Black of the 1988 State High School Powerlifting Championship held at Sheridan High School. You'll see more in the reunion slide show.